This post identifies the members from Franklin County, Maine, up to 1873, including deceased members. W. Bolan of New Sharon, Maine. Dr. W. Wallace Bolan was born June 5, 1840 at Phillips, Maine, or Weld, Maine, depending on the source, the son of Dr. Alfred and Lydia Bolan. Dr. Wallace Bolan received his medical degree at Harvard in 1863 and served as a surgeon in the Civil War. He married twice, I believe: 1) Corilla Brooks (Nickerson) Bolan, "Carrie", who died in 1870; and Frances E. (Diggles) Bolan, who long survived him. In 1883, Dr. Bolan left his practice at New Sharon, Maine, and became a physician at the Home for Disabled Volunteer Soldiers at Togus, in Chelsea, Maine. He died at Togus in 1886. He's buried in the Forest Grove Cemetery at Augusta, Maine, with his second wife. J. R. Eaton of Wilton, Maine. Dr. John Rowell Eaton was born July 14, 1830 at Wilton, Maine, son of Ebenezer Eaton and Patty (Rowell) Eaton, both of whom died before their son was ten years old. Dr. Eaton received his medical training at the Medical College of Maine at Bowdoin College. 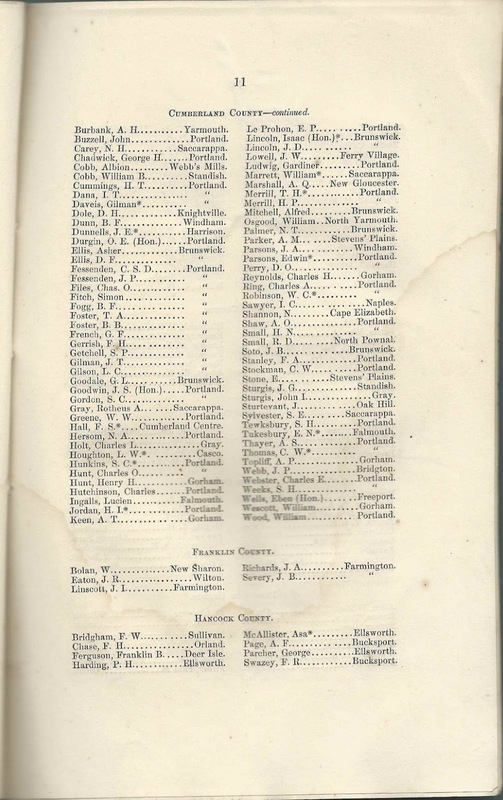 In addition to his medical practice, he was a member of the Maine State Legislature. He married Sarah Sylvia Gould on December 13, 1857 at Jay, Maine. He died April 1, 1885 and is buried in the Lakeview Cemetery at Wilton, Maine, with his wife and at least two children. J. I. Linscott of Farmington, Maine. If the middle initial is a misprint, Dr. Linscott may have been Dr. Joseph Addison Linscott (1812-1895) or, more likely considering how often a handwritten "J" is misinterpreted as an "I", his son Dr. John Jacob Linscott (1846-1928). The latter had received a medical degree at Berkshire Medical College at Pittsfield, Massachusetts, in 1867 and then went into practice at Farmington, Maine. 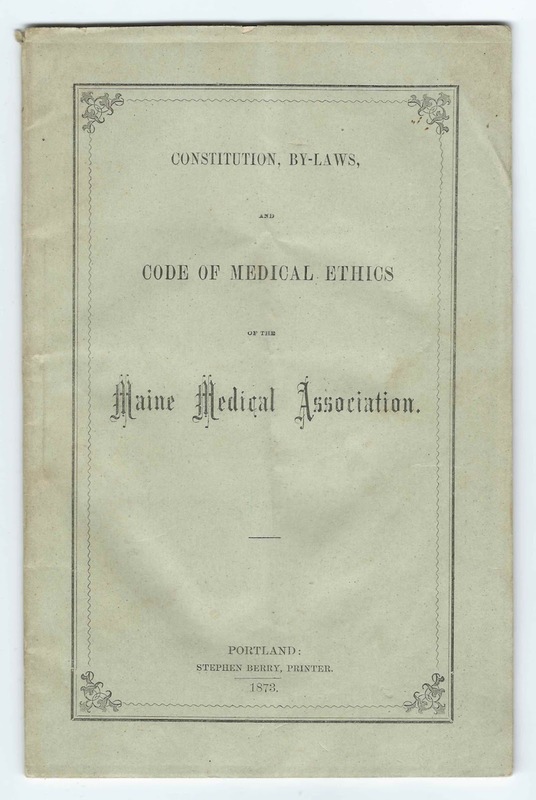 In addition to practicing medicine, Dr. John Jacob Linscott also served in the Maine State Legislature. He married Orena C. Hemenway, "Rena", at Farmington, Maine, on September 10, 1868. Dr. John Jacob Linscott died in 1928 and is buried in the Riverside Cemetery at Farmington, Maine, with his wife and children. J. A. Richards of Farmington, Maine. Dr. John Almond Richards was born September 26, 1829 at Strong, Maine, in 1830, the son of John Richards and Eliza (Thomas) Richards. Dr. Richards attended Farmington Academy at Farmington, Maine, and then studied under Dr. Edmund Russell and graduated from the Medical College of Maine at Bowdoin College in 1854. He set up his medical practice at Strong, Maine, and in 1855 married Sophronia Hillman, with whom he would have several children. In 1870, he moved his practice to Farmington, Maine. He was a U.S. Pension examining surgeon and was a school supervisor. He died in 1897 and is buried in the Riverside Cemetery at Farmington, Maine, with his wife and children. J. B. Severy of Farmington, Maine. Dr. James Blake Severy was born in 1841 at Dixfield, Maine, the son of William Severy and Hester Ann (Blake) Severy. James graduated from Bellevue Medical College in 1873 and over his career practiced in Dixfield, Maine, and Farmington, Maine, and also practiced law and was a judge at Farmington, Maine, and Colorado Springs, Colorado. He married Emma Augusta Bass in Boston, Massachusetts, on June 28, 1866; they had several children. Dr. Severy died March 5, 1901 in Colorado. He buried in the Evergreen Cemetery at Colorado Springs, Colorado, with wife Emma.